For those of you that love animals, this will be a bittersweet story. A video has emerged on social media featuring a pair of poachers hunting an elephant herd in Namibia. In the video, the two men, dressed in safari gear, can be seen stalking the herd, which consists of about 20 full-grown elephants. It’s clear what their intention are, from the huge rifles that each of them are carrying. One hunter can be telling the other to hit the elephant “between the eyes”, and the pair of them open fire on the unsuspecting animal. 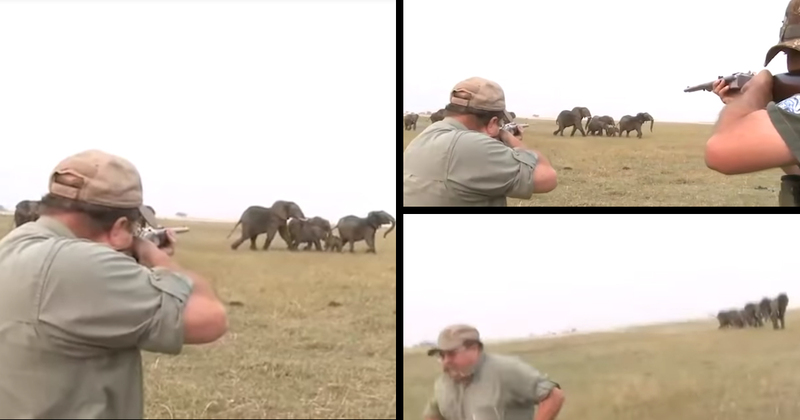 As you might expect, it takes more than one shot to take down an elephant. They fire off about half a dozen rounds before the elephant hits the ground. It’s what happens next that’s remarkable. Elephants are very intelligent animals, and the rest of the herd immediately realise what has happened, and who is is responsible. Straight away, the begin to charge the hunters as a group, and their cries of anger are an incredible thing to hear. The hunters run away frightened, and must have thought that this would be the last thing they ever saw. However, the elephants stop after a while and return to where they were walking, presumably to attended to their wounded friend. Whatever your views on hunting, it’s hard not to feel angry about those who hunt elephants. They’re beautiful, majestic creatures, and what’s more – they’re an endangered species. There are only about 400,000 African elephants left in the wild, a figure that has dwindled down from the millions. Hunters are almost single-handedly responsible for this dramatic downfall in population, with elephants having been hunted for their ivory tusks for basically the whole of the 20th century. The ivory trade has been mostly outlawed, but it still happens, and you still have bozos like this hunting just for a trophy. Namiba-based qualified big game hunter Corné Kruger told News24: “There is a small quota of elephants in the area and we only hunt two elephants a year.” He added that the shooting done by the pair was ‘legal and sustainable’. He went on to say the video was actually taken ‘three or four’ years ago, but only recently came to light after going viral on social media. “I don’t know why it only surfaced now,” he said. He also said that this hunting benefited the area financially. Although big-game hunting is highly frowned up in southern Africa, it is legal as long as strict guidelines are followed – otherwise it is considered poaching, which is illegal. The video is below if you want to watch it, but be warned – as explained above, it features violence against animals which some may find upsetting. Follow Aunty Acid on Facebook for more viral news stories.